This probably is not a surprise to most of us. Cleansing butters, gels and oils have been around since a while now but they have recently started coming into the mainstream. However, it still has a long way to go since the brands that offer these cleansing gems are clearly not drugstore. 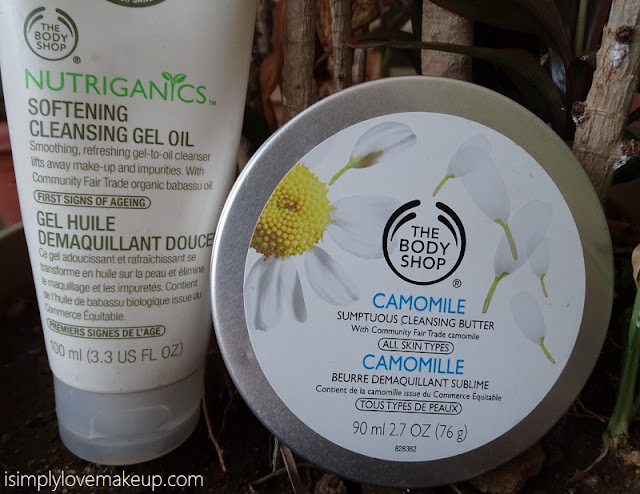 I am a huge fan of The Body Shop Nutriganics Cleansing Gel Oil and The Body Shop Camomile Cleansing Butter. In the polls, people have also mentioned cleansing oils and butters by Mac Cosmetics, Avene, Clarins and Bobbi Brown. This is probably the most effective and cost effective solution to removing one's makeup at the end of a long long day. Honestly speaking before I discovered cleansing butters, I would use Olive Oil and Baby Oil to remove my makeup as well... It just seems to melt away your makeup... The only downside of using oils and gels to remove makeup is that it needs to be followed up by a cleanser or a face wash else you are left with quite a lot of oily residue leaving you feeling not refreshed. In the polls, the most popular oils mentioned were Almond, Olive, Coconut and Baby Oil. Tarannum even mentioned Sesame! The good old makeup remover had to feature in this list now didn't it? Let's be honest, we all started with makeup removers as the ultimate product to help you remove the last bits of your makeup at the end of a long long day... It's been around long before fancy micellar waters and cleansing balms made their way into our kitties, isn't it :) People still use it, my sister for one still swears by her Neutrogena makeup remover and the fact that is ranked 4 in popularity goes to show that a lot of gorgeous women out there prefer it over other means. So whats your take on removing makeup? Does your method feature in the list above or do you have a different albeit unique way of getting rid of makeup?